"Your maps will become out-of-date and as such navigation will be less accurate," the firm told customers. "It has become clear that some of our older generation navigation devices do not have sufficient resources to run the newest maps and software." 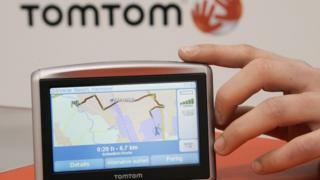 A spokesman for TomTom told the BBC the company had been "proactively" communicating with customers. "A full list of those affected devices is available on our website," he said. In an email to customers, the firm added: "We will continue to provide quick GPS fix updates so your device will continue to function as it does now." Paula Hatcher's partner bought her the Start 20 device because her previous sat-nav - an older model with the same name - had not come with lifetime maps. "I haven't even had the opportunity to update it even once, since the email I received this morning [advised] the withdrawal of lifetime maps," she said. When the BBC contacted TomTom, the company confirmed that there were two devices named "Start 20" and that Paula's, the newer version, would in fact receive map updates. Product descriptions continue to state that maps on these devices will be refreshed multiple times a year "for the lifetime of your device". On its website, TomTom explains that "lifetime" means the "useful life" of a device: "ie: the period of time TomTom supports your device with updates, services, content or accessories. A device will have reached the end of its life when none of these are available any more." Another customer who bought a TomTom Start 25 sat-nav in 2013 said he won't be buying another product from the company. "I will use my current smartphone with updated maps," said Chris Syntichakis. TomTom's sales of devices direct to customers have recently been in "severe decline", according to analyst Chris Jones at Canalys. "Clearly they've identified a business market for future growth - that includes navigation and traffic services integrated into cars," he explained. "Within months the [sat-navs] will quickly become out-of-date when those updates stop appearing," he added. "It's not just new roads, it's [information about] features on roads - road signs, speed limits, rights of way and crossings."